Most trawlers were sunk by U-Boats in World War I after their crews were allowed to leave. Some fishermen were on board several sunken trawlers during the war. Very few died. Fishermen would rather come up against a German U-Boat than a German mine. Having said that - the only Scarborough trawler to be sunk in the war by a mine was the Condor in June 1915. This went down with all hands lost. After the war the German submarines of course stopped their campaign but the mines hung around for years afterwards. In 1919 the Filey drifter "The Emulator" was sunk with all hands on board. 1920 proved to be a terrible year for Scarborough trawlers. Three were sunken by German mines. 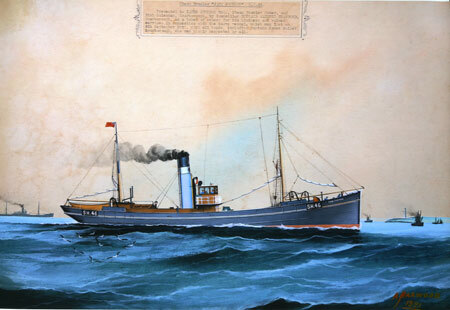 The first loss was of the Strathord on 23rd February 1920. It was fishing 37 miles east-north-east of Castle Hill. It was owned by the Raincliffe Steam Trawling company and was skippered by Samuel Normandale, aged 35. Samuel Normandale came from a long line of Scarborough trawler skippers - his father was Tom Normandale. He had an active war record on board trawlers. He was skipper of the Seal when it was sunk by U-Boat 57 on September 25th 1916. He was onboard the Scorpion when it evaded destruction by U-Boats on a night when many didn't. He did a considerable amount of war service on the Catspaw which was taken over by the Admiralty (The Catspaw was also lost to mines in late February 1920). The Strathord was his first job since demobilisation. - Samuel Normandale, skipper, 1 Paradise Row. - George Cowburn,mate , Grange Avenue. - Joseph Hope, 3rd Hand, 12 Aberdeen Terrace. - Alfred Littlewood, deck hand, Long Greece Steps. - Walter Morley, deck hand - the skippers nephew. - T Atkins, cook, 43 Quay Street. - E Cappleman, first engineer,Clark Street. - J Warwick, second engineer, Clarksons buildings, Longwestgate. - HC Williamson, spare hand, Longwestgate. - J Flynn Jnr, Trimmer, 30 The Bolts. Samuel Normandales brother William Normandale was also at sea and heard the explosion. He wrote "we heard them knocking out the warps to the haul... when there was an explosion,followed by another, which would be caused by the boilers exploding. Then down came a dense fog right on the job before we could do anything. I expect that he either got the mine in his trawl, or got it in the cod endand dropped it onto the deck. But I think it was underneath the vessel, in his trawl. In another three seconds we would have been alongside him". William Normandale didn't know it was his brothers boat. It struck around ten minutes to ten at night. He searched through the wreckage and did not find out which trawler it was. The deck hand, Walter Morley, was a particularly sad loss who was only a boy and went on board "at the last minute" as a replacement for someone called Bielby. He had passed through Sea training school and was the skippers nephew. He had regularly gone on board his uncles boat - William Normandales Spence MacDonald , just for pleasure. The regular engineer, Cammish, had a lucky escape as he had an injured hand and stayed ashore. It was the cooks first voyage. The previous cook Coulson had left for another job. The sadest story probably links to Mr H. C Williamson. He was one of four brothers tragically lost in a short period of time. One brother had died in the war. A second brother had died the previous year in a tragic fall from Castle Hill. He was only young and playing with other boys. He was taken to hospital but died soon after. A fourth brother was in the sanitorium at the time the Strathford was blown up. He died shortly afterwards. Even more tragically the explosion on the Strathford was witnessed by the boys father. He was on board the Filey vessel Tryphena. - Charles Mansfield, third hand. - A Fowler, spare hand. - George Skelton, Chief engineer. - Thomas Raine 2nd engineer.- W Lindsay fireman. Full details of the Taranaki were : SH 225 formerly A445 and sistership to Ratapiko SH221 formerly A446. TARANAKI and her sistership arrived in Scarborough soon after the great war having been purchased by the Stepney Steam trawing company and skippered by Chas Wray. She was built of steel by J Duthie in Aberdeen in 1912 yard no 366. Her official number 129376 and her dimensions were L 120.6 B 22.65 D 14.0 and one of the larger vessels in the Scarborough fleet. Painted grey she carried the Stepney colours of red funnel with black top in the upper part of the red was a white dot with a four bade propeller inside. The month of September saw another Scarborough vessel sunk by a mine. The Jack Johnson was one of Scarboroughs largest trawlers skippered by Mr James Walker. It left Scarborough and was destroyed thirteen hours after it left port on the 3rd September,1920. Another Scarborough vessel, the Stratherrick, was fishing in the vicinity and heard an explosion. They came home and enquired about the "Jack Johnson". It was a large trawler and was not overdue. It could stay out all week. But Scarborough was extremely anxious. Then anxiety gave way to gloom as the vessel did not return. - James Walker, Skipper, 152 Longwestgate. - F Crosby, third hand. - H Trotter, deck hand. - E Eves, deck hand. - E Matson, deck hand. Skipper James Walker, was highly associated with the vessels of James Johnson. He was on the Seal when it was sunk by U-Boats. He was also on board the Merrie Islington when the U-Boats sank that. He also encountered a shot down zeppelin which "narrowly missed his vessel". He was later presented a Gold watch for his wartime services by James Johnson. Other crewmen had wartime experience. TH Cappleman served as an engineer on two boats sunken by U-Boats. The cook, J Pye was also on board the Seal with James Walker. "Steam Trawler: Jack Johnson. Presented to James Johnson esq, steam trawler owner and fish salesman,Scarborough, by Richard Wardell Crawford, as a token of his esteem for his kindness and valued services in connection with the above vessel, which was lost on 4th September 1920, with all hands, including Captain James Walker, who was highly respected by all".